03/02/08 A183. 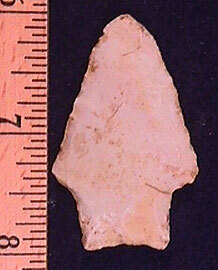 (A177) Archaic knife, 3", TN, hornstone, ex-Jerry Dickey, thin and nice, $30. 03/02/08 A184. 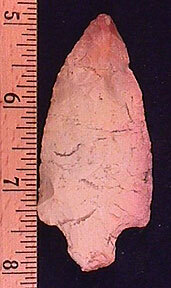 (A178) Pickwick, 3 1/8", TN, pink and tan, $15. 10/28/07 A185. 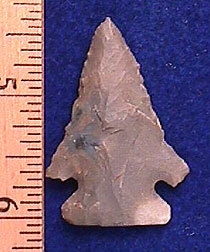 (A179) Pinetree, 1 11/16", southern IN, hornstone, well made with a needle tip, $39. 10/28/07 A186. 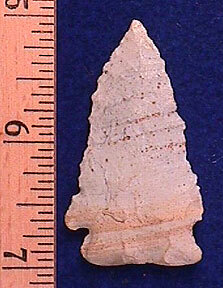 (A180) Pinetree, 1 15/16", KY, attractive banded chert, thin and well made, one ear worked away (not broken), $$39. 08/08/07 A187. 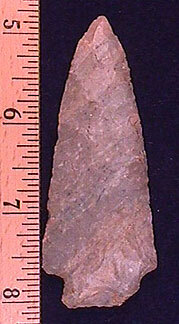 (A181) Benton, 3 1/4", TN, Ft. Payne, well made, ancient impact fracture on left side of tip and right side of base, $25. PRICE REDUCED TO $17. 08/08/07 A188. 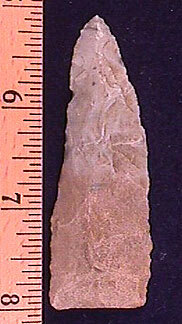 (A182) Johnson point, 1 15/16", Clay Co., AR, Burlington chert, ex-Ken Partain, thin with fine edge work, $15. PRICE REDUCED TO $10. 08/08/07 A189. 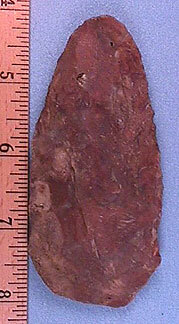 (A183) Blade, 4", Marion Co., FL, reddish brown with fossil inclusions, ex-Cliff Duvall, appears to have been used as a backed knife (left side of the blade has been dulled), well made, $25. PRICE REDUCED TO $19.